Folks expect to see certain information about the Pastor and his background when visiting church web sites. I was tempted to leave this space blank because the ministry at Westminster Bible Church (WBC) really isn’t about me. It’s about God. It’s about God growing a body of believers and transforming them more and more each day into the likeness of His Son, Jesus Christ. It’s about those believers being used by God to take the Gospel to a lost and dying world. It’s about those believers being used by God to serve, to care for, and to challenge each other as we walk along the road of our lives together. If the ministry at WBC becomes about me, then I will have failed in my calling to be used by Him and for Him in the life of the Body of Christ. Life and ministry are first and foremost about Jesus, and secondly about people ministering to each other. I won’t leave you completely disappointed -- I just want to keep the main thing the main thing. I have the privilege of serving my home church. I was saved in 1991 through the ministry of Westminster Bible Church at the age of 26. I was baptized at WBC, my wife and I were married at WBC, I received the call to ministry at WBC, and ultimately the call to Lead Pastor at WBC. Much has changed since 1991, but the sense that Jesus is at work, building His church, has not. To give you a brief resume, I received a B.A. in Communications (Radio/TV) from Shippensburg University in 1987. Next I worked for CareFirst BlueCross and Blue Shield of Maryland for 13 years starting in Customer Service and moving into Quality Assurance (no jokes, please). While at CareFirst, I felt the call to give my life to serving the Lord, so I began taking seminary courses. In 2003 I began to serve as Youth Pastor at WBC, and in 2005 I received a Master of Arts in Christian Counseling and Discipleship from Capitol Bible Seminary. 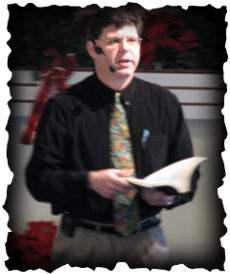 In December 2009 I began serving as Lead Pastor at WBC. The Lord has used me on the mission field in Cameroon (where I first preached) and Peru where WBC has a ministry of evangelism, equipping, and encouraging. It is my heart to see people come to Christ and grow in their faith. To see hurting (we are all hurting) people grab hold of the life-changing truth of the Gospel and allow that to become the controlling reality in their lives -- this is the focus of the youth ministry God built at WBC and remains the focus of the Church in obedience to Matthew 28:18 - 20. I also enjoy gardening, sports, running (mostly so I can eat), losing my cell phone, and spending time with my wife. Robin is a Music Teacher in Carroll County, and we have been married since 1994. Now, that’s enough about me -- let’s talk about Jesus.